ASBURY PARK – Elizabeth Burns stood on Asbury Park’s Fifth Avenue, between the railroad tracks and Main Street, an umbrella protecting her from Tuesday’s drizzle. 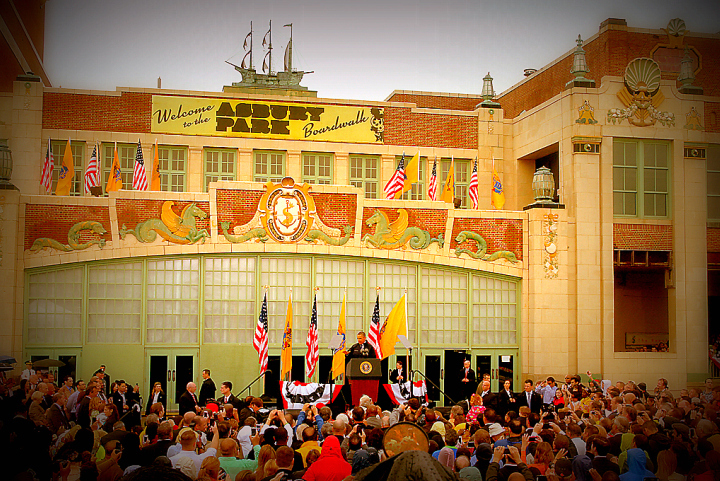 A good thing President Barack Obama was visiting the boardwalk area with Gov. Chris Christie, showing the Shore is open for business for the summer season. But some criticized the visit for various reasons: a waste of public money, an inconvenience to people stuck in the secure area that extended to Memorial Drive along the Fifth Avenue area, that a visit of harder-hit areas would be more appropriate. “Instead of looking at things that are getting fixed, why not look at things not getting fixed — Union Beach, Keansburg?” asked Candy Storey, 52, of Neptune, who got stuck in the secure area while running errands. “Union Beach, there’s still homes devastated. It’s such a shame. “I know they have to have security, but people are stuck,” Storey said. Kim Baker, 45, of Oceanport made the best of getting stuck in Asbury Park, trying to return home from a shopping trip to Neptune. “Been (stuck) three hours now,” she said. Baker said she knew the president was visiting, but did not realize the traffic issue it would cause. Yes, she asked to use the restroom — and was given permission — at the Basin Bar, an organic juice establishment on Fourth Avenue between the tracks and Main Street. But she added, “I got video, nice pictures” on her cellular telephone. Mictaj Jones stood in front of the Sunrise Early Bird Unisex Barber Shop, the Fifth Avenue business where he cuts hair. “(To) catch a glimpse of the first African-American president coming into Asbury Park,” said Jones, 37, explaining having a person of color as president was important to him, because he was a minority as an American Indian. Jones, a city resident, said he had never voted until Obama ran for president in 2008 and he voted for him. “It’s not an inconvenience, that’s for sure,” said Alice Irizarry, 56, a city resident who works for the Visiting Nurse Association of Central Jersey on Fifth Avenue, but got stuck on the other side of the street. “It’s the president of the United States. Burns praised Obama, a Democrat, and Christie, a Republican being talked about as a possible candidate for president in 2016, for appearing together. Had Burns not had company over the Memorial Day Weekend, she would have stood in line to get a ticket to the president’s visit, she said. And had Jones not been out of town over the weekend, he would have stood in line for a ticket, he said. Chin said she would have liked a ticket, too. But Chin, who served in the Army for two decades, said she had met the first President George Bush when she was in the military. Inside the Sunrise Early Bird Unisex Barber Shop, there were no customers as people awaited the president. To note, Jones is not only a barber, but a stand-up comic. The COASTER photo for the ASBURY PARK historical record. All rights reserved. Posted in Asbury Park City Desk and tagged Asbury Park, Joe Sapia.